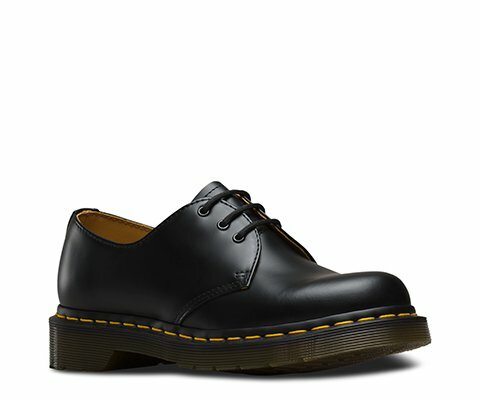 The 1461 Smooth Yellow Stitch is Dr. Martens classic 3 eye shoe. It is the second style that Dr. Martens made. This 3 eye shoe was crafted for industry and made rebellious by generations of non-conformists. The 1461 style carries Dr. Martens signature style: grooved edges, yellow stitching smooth leather, a lightly textured, firm durable material with a semi bright appearance. Built to last with Dr. Martens iconic, comfortable air-cushioned sole. Oil and fat resistant, with good abrasion and slip resistance. The 1461 is a Goodyear-welted product. The upper and sole are heat-sealed and sewn together, not merely glued like many footwear constructions.